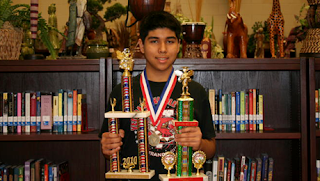 VETERANS MIDDLE SCHOOL – VMS 8th grader, Andres Salazar, is the District Champ for the RGCCISD Spelling Bee for the second year in a row! This outstanding achievement qualified him for the regional competition that was held at South Texas College in Weslaco in the spring. 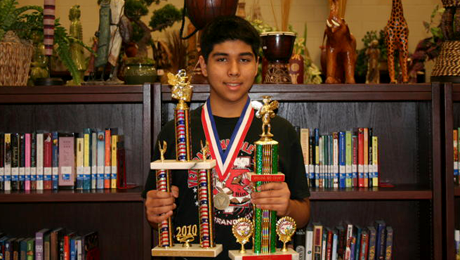 VMS is also proud to announce that at the Rio Grande Valley 22nd Annual Regional Spelling Bee competition, Andres earned 2nd Place after competing with students from forty-eight different schools from Roma to Brownsville ! Congratulations Andres for your dedication and achievements! Andres is the son of Pedro and Rosa Salazar and is coached by Ms. Ester Cruz. RGCCISD photo.